At drupa 2012, the PrintCity Alliance will emphasize and promote the future of print from its usual location on the Messe Düsseldorf fairgrounds. Last week, some of its members gave a preview of what awaits visitors to Hall 6. “Connection of Competence” is the slogan of the PrintCity Alliance, a manufacturers’ cooperative that exhibits jointly at the drupa expos and, in the intervening years, works to promote best practices in printing, packaging, and publishing. Last week, nine of its member companies gave a preview of what PrintCity will bring to drupa 2012 in a program of media briefings at a conference center near Munich, Germany. Attended by about 60 journalists from around the world, the two-day event featured pre-show product announcements from the nine vendors (to be reported in Part 2) as well as general sessions on print industry trends. Among the vendor presentations was an update from manroland web systems, under new ownership following the bankruptcy and breakup of its former constituent company. The presence of manroland web systems—once paired with a sheetfed division that also has come under separate new ownership—was a reminder of how much the vendor landscape has changed since PrintCity put on its last joint exhibit at drupa 2008. John Dangelmaier, president of the alliance, noted that consolidation has trimmed his members’ ranks as surely as M&As and other forces have reduced the number of printers in nearly every country. Where PrintCity once had the support of five paper manufacturers, Dangelmaier said, it now relies on three; only one blanket manufacturer remains of the trio that used to belong. On the eve of drupa 2012 (May 3-16), the alliance consists of 18 full members and 22 partner companies that take part in selected projects. Members participating in the Munich briefings included, besides manroland web systems, Eltosch, Kurz, m-real, Océ, Procemex, Sappi Fine Paper, Trelleborg, and UPM. At the show, in PrintCity’s customary location in Hall 6 on the Messe Düsseldorf fairgrounds, alliance members will “emphasize and promote the future of print,” Dangelmaier said. But, he cautioned that the print medium’s long-term survival isn’t something to be taken for granted. PrintCity’s faith in the medium is steadfast, “but we know that believing alone does not assure the future of print,” Dangelmaier said. He also noted that drupa 2012 would be the “most demanding” drupa in the alliance’s 14-year history because of the difficult economic conditions facing printers in many parts of the world. Alliance members will rally around the theme of “Print: Seen! Lean & Green” as they try to build an impression of optimism that is greater than the sum of its parts. “Seen!,” explained Dangelmaier, refers to the high visibility of print among the graphic media and the value it continues to add to communications. 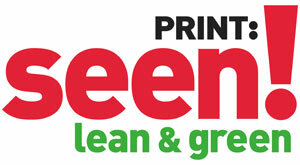 “Lean” denotes print’s ever-improving efficiency as a manufacturing process and its increasing ability to deliver “Green” benefits of sustainability. Four “hot topic” visitor attractions will complement PrintCity vendor exhibits in Hall 6: Digital & Offset Printing; Tune-Up Your Web Press; Value Added Printing & Packaging; and Lean & Green Opportunities. PrintCity also is joining forces with a global print advocacy coalition, the World Print & Communication Forum (WPCF), to host a print-focused international environmental conference at the drupa Congress Centre on May 10. PrintCity works cooperatively with Print Power, a European initiative dedicated to promoting print media through marketing and advertising. The alliance also operates an educational publishing program that most recently released a detailed special report on process color standardization. During last week’s briefing, the alliance’s commitent to pro-print activism was evident in a keynote presentation by Nigel Wells, manager of projects and publications for PrintCity. Exploring the meanings of “Print: Seen! Lean & Green,” Wells declared that it isn’t correct to think of print of having “a future.” What it possesses, he said, is a “mix of multiple futures” that printers must learn to manage profitably. Although there are exceptions by region and niche, “massive structural and economic collisions in the print media markets” are making it difficult for printers to get a handle on the mix of futures that lie ahead of them, Wells said. What’s more, as far as revenue growth is concerned, there will be “no return to the glory days of the late 20th century,” and the “rightsizing” that is shrinking the industry hasn’t yet run its course. Wells, who put his presentation together with the help of a team of students from Stuttgart Media University (HdM) in Stuttgart, Germany, reviewed the outlook for print in various application segments. Among megatrends favoring the medium, he said, are the global growth of literacy, driving the demand for reading materials; and the boon for packaging implied in the need to feed a world population that could approach 9 billion by 2050. • Despite a 1.1% decline in the demand for newsprint from 2010 to 2015, newspapers continue to reach a bigger worldwide audience than the Internet (2.3 billion people for papers vs. 1.9 billion online). • The number of magazines launched in 2011 increased by 30%. Publishers are underpinning the popularity of magazines by combining them with complementary e-media such as QR codes and augmented reality (AR). • Although the picture for catalogs and directories is “mostly negative,” consumers continue to trust and use other kinds of promotional print—especially when they are combined synergistically with e-media. • Packaging and labels represent a “universal growth market” that will, as it expands in both mature and developing markets, integrate new technologies to reduce waste, improve sustainability, and make packages more multi-functional. “Print is not good,” concluded Wells. “It’s great,” thanks to the numerous value chain improvements that printers and technology vendors have achieved over the last 20 years. Less effective, he said, have been the industry’s efforts to promote the efficiency and the appeal of print media. According to Wells, the industry can anticipate a return to stability even as it downsizes—as long as it remembers that in all forms of print, “content is king.” The quality of the content, he said, is ultimately what inspires loyalty to any medium. Patrick Henry, Executive Editor for WhatTheyThink.com is also the director of Liberty or Death Communications, a consultancy specializing in research, education, promotional, and editorial support services for the printing and publishing industries. Patrick Henry is available for speaking engagements and consulting projects. To get more information contact us here. Please offer your feedback to Patrick. He can be reached at patrick.henry@whattheythink.com. Are You Ready for the MarTech Explosion?